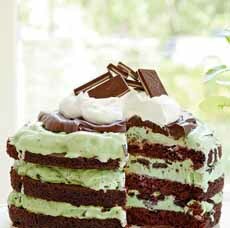  Devil’s food cake and mint chip ice cream (photo Jennifer Davick | Southern Living). 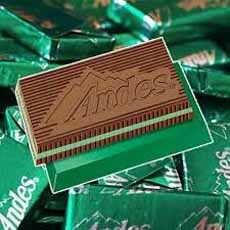 Andes Mints (photo courtesy Sweet Factory). After Eight Mints (photo courtesy After Eight | UK). We’ve been saving this recipe from Southern Living for our St. Patrick’s Day lead-up, when our recipes wear a tinge o’ the green. Made with a Devil’s Food cake mix (or from scratch, if you like), the ice cream doesn’t have to be mint chip. Those who don’t like mint can tint vanilla chip ice cream, or plain vanilla, with green food color. The topping is chocolate ganache, chocolate mints and whipped cream. We skipped the chocolate ganache, not wanting to gild the lily (it also saves time and money), and used Chocolate Reddi-Wip to anchor the mints around the rim of the cake (it’s easier to slice than cutting through the pile in the picture). Make the whole cake ahead and freeze until ready to serve. Prep time is 30 minutes, freezer time is 10 to 12 hours. 1. PREHEAT the oven to 350°F. Grease and flour three 8-inch round cake pans. Line with parchment paper. Prepare the cake batter and spoon it into the pans. 2. BAKE for 12 to 14 minutes or until a wood toothpick inserted in the center comes out clean. Cool in the pans on a wire rack for 10 minutes. Remove from the pans to wire racks, peel off the parchment paper, and cool completely, about 1 hour. 3. PLACE one cake layer in a 9-inch springform pan. Top with one-third of ice cream (about 2-1/3 cups); sprinkle with half the crushed wafers. Repeat with the second layer. Top with the remaining cake layer and ice cream. Freeze 8 to 12 hours. 4. MAKE the ganache. In a small saucepan, scald the cream. In a small bowl, carefully pour the hot cream over the chocolate pieces. Stir in the butter. Stir in the liqueur. Store in the fridge, sealed in a plastic container, until ready to use. 5. REMOVE the cake from the springform pan, and place it on a plate or a cake stand. Spread the top with the ganache. Let stand 15 minutes before serving. Garnish as desired before bringing to the table.